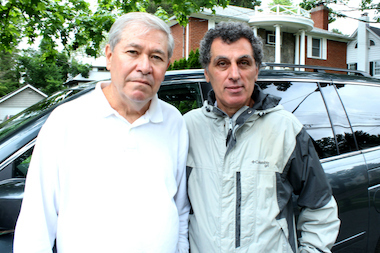 Turkish immigrant Mel Kalyoncu (right) gave his friend George Arnold (left) and his wife a ride to Kennedy airport. After the Arnolds went into the airport, TLC inspectors accused him of being an illegal livery cab driver. Inspectors issued Kalyoncu a ticket and seized his car. DOUGLASTON — Postal worker Melih Kalyoncu said he was just doing a favor for two longtime friends — delivering them to Kennedy Airport so they could catch a flight to San Francisco. But the good deed cost him his car, nearly $1,000 in fines and a day’s pay after city inspectors accused him of operating an illegal taxi when he dropped off the friends on May 1. Kalyoncu, a Turkish immigrant, said he tried to explain to the city’s Taxi and Limousine Commission agents that he had known his passengers for more than 20 years, but they didn’t believe him. Those friends, George and Carol Arnold, told DNAinfo New York that they believe inspectors profiled Kalyoncu, 62, because he was a Muslim with a Quran on his dashboard who was dropping off a white couple. Kalyoncu and the Arnolds came forward after reading a story DNAinfo published last week about a Bayside couple suing the TLC over similar accusations of profiling. That lawsuit claims that last year city inspectors accused Dan Keys Jr., a black car salesman, of operating an illegal taxi after they spotted him dropping off a white female passenger at a Flushing mall. The passenger was actually Keys’ biracial wife Symone Palermo, whom he was taking to work. Between July 1, 2013 and June 13, 2014, TLC's 170 enforcement inspectors have issued 14,300 summonses to drivers of unlicensed vehicles making illegal hails, according to agency spokesman Allan Fromberg. The inspectors seized 8,798 vehicles during that time. Drivers can’t retrieve their impounded cars unless they plead guilty and pay a fine or wait until their assigned hearing date to make their case before a city administrative judge. He said enforcement is critical to protecting the public from illegal drivers who have not met TLC’s high standards, lack insurance or who are not held accountable for actions the way licensed hacks are. However, Keys, Palermo and Kalyoncu all claim the inspectors made assumptions based on their appearance and were inflexible when they tried to explain the situations. Kalyoncu, a married father of two who immigrated to the U.S. in 1980 and lives in Little Neck, picked up the Arnolds from their Douglaston home at 5:45 a.m. on May 1. The postal worker got to know the couple by delivering mail to them for the past 20 years. Kalyoncu and George Arnold said they speak nearly every day. Their conversations bounce from hobbies — photography and gardening — to news about each others’ children. The three arrived at Kennedy’s Terminal 8 around 6:30 a.m. When the Arnolds got out, Kalyoncu waved off Arnold’s attempt to give him gas money. After the Arnolds entered the terminal, Kalyoncu planned on heading straight to his mail route to start his workday. But TLC inspectors swooped in, standing in front of his car and demanding to see his license and registration. “I have no idea what’s going on. I say, ‘Let me go. Did I do something wrong, some kind of double park?’” Kalyoncu recalled. The inspectors accused him of making an illegal hail and wrote him a ticket. The Arnolds said that when they entered the terminal, they assumed Kalyoncu had driven away. When the Arnolds kept walking, the man flashed a badge but said nothing, they said. They kept walking to the security gate and never thought anything more of the interaction until they returned to the city three weeks later and Kalyoncu told them what happened. Kalyoncu said the inspectors seized his car at the airport and he was given a May 13 hearing date. But the postal worker needed his minivan for work and couldn’t wait two weeks to defend himself before a judge. Instead he decided to plead guilty the same day his van was seized. He paid a $600 fine, plus another $381 to the impound lot. Kalyoncu’s boss issued him a warning letter for missing work that day. “Whoever they picked up were Pakistanis, Turkish or Russian people,” he said. George Arnold said he and his wife felt terrible about the incident and have even considered legal action.